SO... I BOUGHT STUFF || HAUL | RAWR BOWS. A few things have happened recently that have led me to purchase things that maybe weren't 100% essential. It's totally not my fault. First of all, I moved into a new apartment so excuse number 1: I need stuff to decorate my room and make it more cosy. Then there was the student lock in at Westfield. Living dangerously close to the shopping center, I HAD to go and take advantage of all the discounts. So there's excuse number 2. Finally, I went back to Westfield a few days later to buy a present for a friend and accidentally walked into Urban Outfitters and went to the sale section. Excuse number 3: who can say no to discounted candles and cute glasses. Certainly not me. In an attempt to justify spending all this money I thought I would do a haul because that's what people do, right? Flamingo Candle Oriental Lotus & Rose Otto. This was on sale for £6 which is really cheap for a scented candle that actually smells. Plus, it's really cute and you get a jar once the wax is all melted. It smells really fresh and sweet, even though I wouldn't say it smells like rose. Originally, it was £15 and I don't think I would pay that much for it as I can get a Yankee Candle for cheaper, but if you ever find it on sale I would totally recommend it. Diamond Drinking Jar. As soon as I saw this, I knew I had to get it. I'm aware I don't drink enough water, not even close, so I thought that maybe getting this super cute jar would make me drink more. So far, it's been working. I'll keep you updated. Fake Plant. My idea was to get little cacti for my room but when I went to IKEA they were sold out - apparently people love cacti now. Instead of getting a real plant I decided to get this fake one for two reasons 1) there's no way it's going to die 2) it was actually prettier than the other real plants. Nivea Lip Balm. Last winter I used the Macadamia and Vanilla one, but my sister seems to have a tendency to steal all my lip balms so it is now 'hers'. My lips are already getting really dry so I had to fix that. 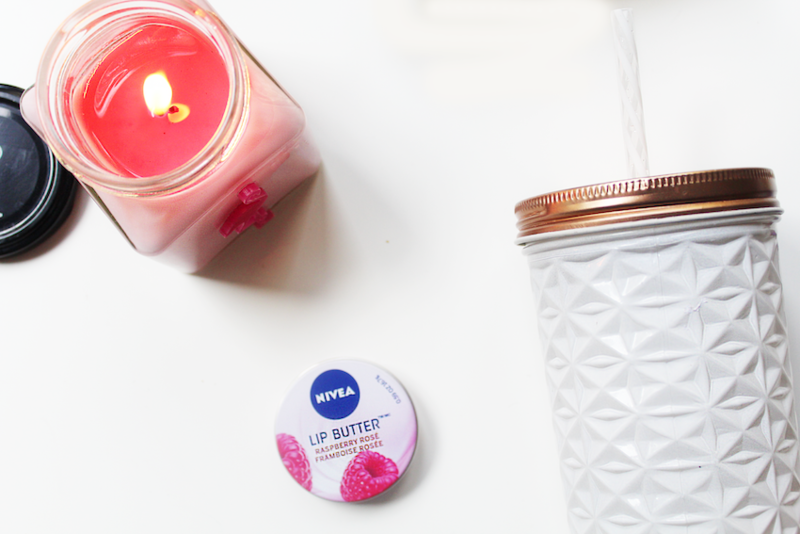 I love Nivea's lip balms, they are really hydrating and smell amazing! Rimmel's Super Curler Mascara. After using Benefit's They're Real and Roller Lash mascara for a year now, I had pretty high expectations for a mascara. This mascara, whilst it's considerably cheaper, it doesn't lengthen my mascara as much as I would like it. 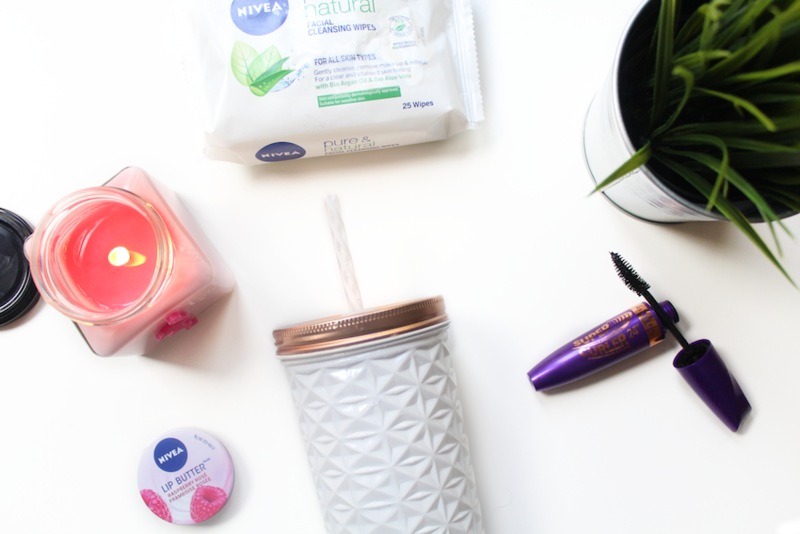 Nevertheless, it gets the job done and makes my lashes look better. 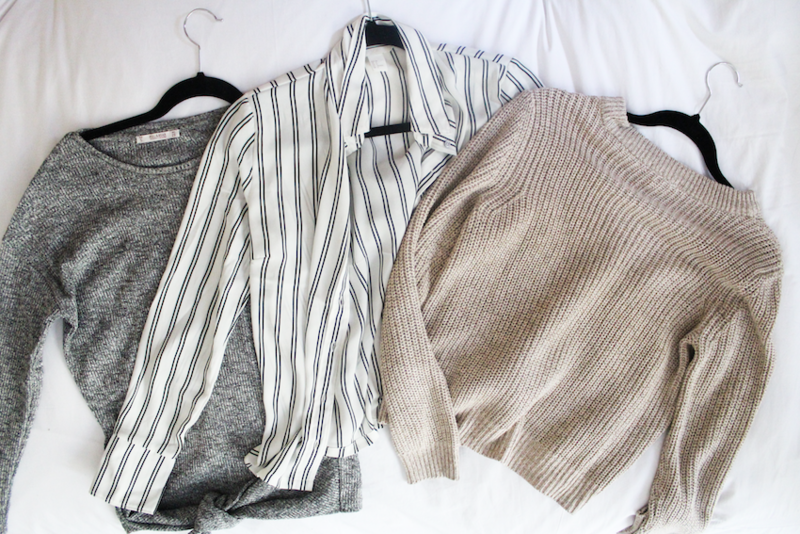 Pull&Bear Jumper. Recently, I decided to branch out and get a jumper that wasn't black. So I got a grey one - well done me! I might have sticked to the same colour palette but it's definitely a really cool jumper. It has two string on the sides that you can tie at the front (not really well explained... soz) so it gives it a unique twist. H&M Jumper. H&M doesn't usually have student discount but they had 20%off that day so I had to get something. Right? This time I did branch out a bit and got a light brown jumper - be proud people. It fits me perfectly and it's the perfect length to wear with a shirt underneath. H&M shirt. I've been wanting to get a striped shirt forever but could never find one that I really liked. This was the first thing I saw when I walked into the store and it was a match made in heaven. I was meant to get that shirt, it was made specially for me. I would wear it every day if I could. It's so flowy and soft and pretty. And that's it for my little haul, what have you been buying recently?